The idea of a man drawing on memories and adventures that he speaks of today. 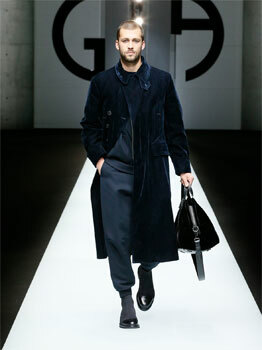 For Autumn/Winter 2018-19 Giorgio Armani employs freedom of expression and love of synthesis to explore an imaginary world of action and elegance, inhabited by men who are proud but gentle in their movements. Men who dress carefully, without frivolity, and who express themselves through nonchalant gestures, in a natural dialogue between body and clothes. The eight-button double-breasted jackets with peak lapels emphasise waist and shoulders, outlining a toned physicality. The trousers are fluid, cargo or jogger. The long coats and high-necked bomber jackets bestow a relaxed elegance. The accessories are strong in character: sturdy boots, large, soft backpacks, and hats with earmuffs. The research focuses on texture: luxurious but never showy, it is expressed through craft materials and processes that make surfaces soft to the touch and opaque in appearance, testament to a life already lived. There is a narrative inherent in the colour range: a progressive movement designed to surprise, it opens with cashmere-type muted tones and shades, before fading into light khaki, grey and, finally, solidifying into black, with unexpected touches of emerald and ruby.